Swansea City goalkeeper Gerhard Tremmel expects to be back on the bench when Lukasz Fabianski returns from suspension for Saturday's Premier League match at Hull City. Tremmel, 36, came on during the 3-1 defeat at West Ham after Fabianski's red card, and started in the 2-1 loss to Tottenham a week later. But the German anticipates a return to the bench when Swansea visit Hull. "Yeah, probably. I enjoy playing and there's nothing more to say," he said. 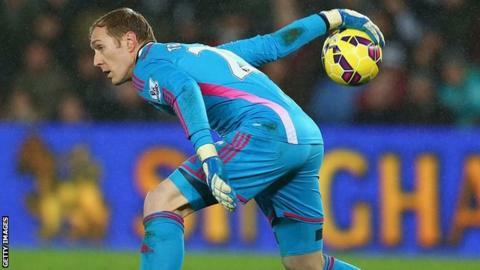 Sunday's defeat to Tottenham was Tremmel's first Premier League start since the 3-1 win away at Sunderland in May. The former Red Bull Salzburg goalkeeper has been a fringe player since he joined the Swans in 2011, filling in as a second choice to Michel Vorm before Fabianski moved to the Liberty Stadium in May. Tremmel expects to be back among the substitutes against Hull, and hopes Swansea can return to winning ways after two successive losses. "I'm very disappointed with the result but I think I had a good game," he said after the Tottenham defeat. "That's football. We can respond straight away next week in Hull. "You surely don't want to have three games lost in a row, so we want to make sure we get points there."